The STS-107 crew trains for their mission, learning about the experiments they will be on board. 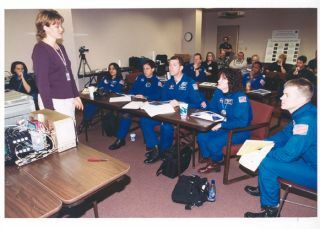 In this historical photo from the U.S. space agency, the STS-107 crew in the In-Flight Maintenance training, learning more about experiments that were a part of the mission on Dec. 5, 2000. Seated in front (left to right) are Mission Specialist Kalpana Chawla, Israeli Payload Specialist Ilan Ramon, Commander Rick D. Husband, Mission Specialist Laurel Clark, Pilot William C. "Willie" McCool; in back are Mission Specialists David M. Brown and Michael Anderson.